Eight Nobel peace prize winners, including Archbishop Desmond Tutu of South Africa, on Tuesday asked China to end its 'repressive' policies in Tibet and expressed their support to Tibetan spiritual leader Dalai Lama's efforts to achieve autonomy for his homeland. 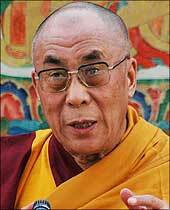 The support by Nobel laureates -- Jody Williams, Shirin Ebadi, Mairead Corrigan Maguire, Desmond Tutu, Rogoberta Menchu Tum, Adolfo Perez Equivel, Betty Williams and Wangari Maatai -- was contained in a signed letter handed over to the Tibetan temporal head. It was handed over by Mairead Magquire, Jody Williams and Shirin Ebadi at a ceremony, sources in the Tibetan government-in-exile in Dharamsala said. They also asked the Chinese government to implement laws that are enshrined in their constitution for a legitimate and meaningful autonomy for all Tibetans, the sources added. "For 50 years, the Dalai Lama and the Tibetan people have waged a peaceful struggle to preserve their ancient culture, religion, language and identity. "As the issue of Tibet remains tragically unresolved and Tibetans continue to endure repressive conditions in Tibet, we wish to express our concern and support Dalai Lama for his non-violent efforts to achieve autonomy for Tibetan people," they said in statement. They urged the Chinese government to "take immediate and constructive steps to resolve the status of Tibet and end oppressive policies that continue to marginalise and impoverish Tibetans in their own land".